Columbus Day Weekend offers peak leaf peeping in Adirondacks, Catskills, Chautauqua-Allegheny, Central New York regions This is the fourth 2012 FALL COLOR REPORT for New York State. Reports are obtained from field observers and reflect expected color conditions for the coming weekend. FALL COLOR REPORTS are issued every Wednesday afternoon. Albany, N.Y. - Leaf peeping and Columbus Day weekend go hand in hand, and this year&apos;s holiday weekend will offer some of the best foliage viewing opportunities in New York State in years, according to observers for Empire State Development&apos;s I LOVE NEW YORK program. Peak colors are spreading from the Adirondacks to the Catskills, the Chautauqua-Allegheny and Central New York regions, with near-peak and midpoint color in many other areas. Bright, beautiful peak colors continue to spread across the Adirondacks. In Essex County, in the High Peaks region around Lake Placid as well as the Keene and Keene Valley areas, foliage will be peak this weekend with some of the most magnificent fall colors in recent memory. Look for amazing shades of red, along with additional hues of gold, burgundy and yellow. 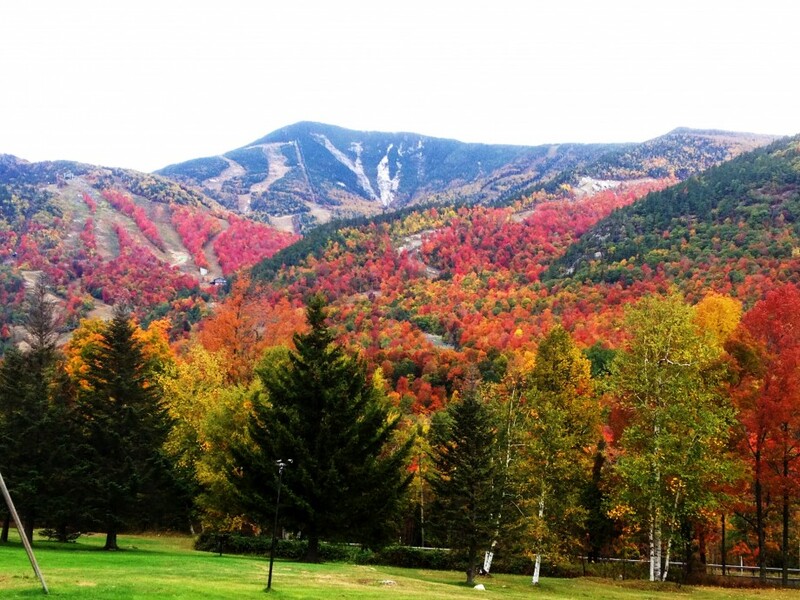 In the area surrounding Whiteface Mountain, color spotters expect 75 percent color transition and peak foliage by the weekend. The reds are spectacular this year, with oranges, burgundies and all shades in between dotting the hillsides. The Schroon Lake area is near peak. Leaf droppage is minimal and the color has gone from muted to bright. Look for shades of red and orange. The Bloomingdale area reports reds, golds, ambers and purples among their peak shades, all contrasting nicely with the evergreens. Foliage spotters in Franklin County reporting from Saranac Lake expect 90 to nearly 100 percent color transition by the weekend. "Magnificent," "Startling and "Incredible" are just some of the ways area spotters are describing the leaves this week. The Lake Clear and Paul Smiths areas are sporting every color in the spectrum, but particularly noteworthy are the oranges and yellows of the sugar maples and the bright reds of the red maples and high bush cranberries. Kiwassa Lake spotters note leaves of pink, gold, red, dark red, maroon, orange and yellow. Look for 95 percent color change and a brilliant display of yellow, copper, pumpkin, burgundy and shades of adobe red in the Mt. Arab/Tupper Lake area, where leaf peeping continues to be sensational. In Herkimer County, Old Forge leaf peepers report nearly 100 percent leaf transition and some of the brightest and boldest color in years contrasting nicely with the evergreens. The stage of change is just a little past peak, but there&apos;s still some great foliage viewing there this weekend. In the Adirondacks area of St. Lawrence County, expect peak conditions from Pitcairn to Piercefield, with an average mix of orange, yellow and red leaves. In Warren County, foliage spotters based in North Creek and Blue Mountain Lake expect peak foliage with 85 percent color transition this weekend. There are brilliant leaves of red and orange on maples and yellow on birch and sumac. In the southern portion of the county, look for 40 percent color transition and midpoint of change with fall shades of red, orange and yellow. In the Lake Champlain area of the Adirondacks the color transition is still in the early stages and will be between 20 and 30 percent by the weekend. Look for great shades of apple-red and pumpkin-orange. Over the past week, color change and intensity have significantly increased in the Catskills. In Delaware County expect peak conditions with 90 percent color change and bright to very bright shades of red, yellow and orange. The full splendor of autumn has finally arrived in Ulster County&apos;s mountain towns. Foliage spotters at Belleayre Mountain in Highmount expect peak foliage with 85 percent color transition by weekend and bright, brilliant shades of orange, red and yellow. Pale yellow and shimmery gold foliage with splashes of orange prevail throughout the quaint Rondout Valley communities of Hurley, High Falls, and Stone Ridge. Catskill Mountain towns including Woodstock and Phoenicia report their foliage as peak with a full range of fall colors on display from yellow to deep burgundy. In Saugerties, expect near peak to peak foliage with 85-90 percent leaf change and a variety of bright oranges, golds, reds and yellows. Foliage spotters reporting from Catskill Park in Greene County note that some of the best fall colors seen in years are now on display. By weekend expect bright, brilliant shades of red, orange, yellow and purple. Spotters in Lanesville expect peak or very near peak foliage by the weekend with very bright shades of amber, yellow, orange and red and brown. Color change in Sullivan County will be around midpoint by the weekend, with 50 percent leaf transition and bright orange, red, burgundy and golden yellow leaves. Peak and near peak color is dominating the Chautauqua-Allegheny region. Foliage spotters in Cattaraugus County expect peak conditions by the weekend. At Allegany State Park, 75 percent transition is predicted with yellow, red and orange leaves of average brilliance. Oaks are just starting to peak there. Spotters in Little Valley expect 65 percent transition with a bright mix of yellows, oranges, reds and greens. In Chautauqua County, look for near peak foliage 65 percent changed and bright shades of orange and yellow. Peak fall color will brush the northern portion of the Capital-Saratoga region this weekend and also make appearances in the region&apos;s eastern section. In Fulton County, look for peak foliage with bright gold, red and orange leaves; leaves in the southern part of the county, outside Adirondack Park, will be less changed and more muted in appearance. Near peak and peak foliage is making its way into Rensselaer County. As usual, more color is showing off in the eastern and northern portions of the county. Look for 55 to 75 percent color change. Look for many bright, beautiful shades of orange, red and yellow. The southern and western portions of the county will be at midpoint of change by weekend. In Albany County, foliage spotters in the Thacher Park area of Voorheesville expect midpoint foliage conditions with 50 percent color change and bright yellow and red leaves. Color will also be at midpoint of change in Saratoga County, where 40 percent leaf change is expected. Foliage spotters in Saratoga Springs note that bright, vibrant shades of yellow and orange are visible throughout much of the area with subtle reds mixed in. In Schenectady County also expect around 40 percent color change with yellow leaves predominating over a green backdrop with shades of red emerging. In the Central New York region, peak foliage is expected in Chenango County with nearly complete leaf change and muted shades of yellow and orange. In Oneida County, spotters in Utica expect 75 percent leaf transition with average to somewhat muted shades of orange, gold, bronze and amber highlighted by vibrant shades of yellow. Look for peak conditions in the northern portion of the county, near peak to the south. Binghamton-area spotters in Broome County are also calling for peak this weekend. Look for bright yellow, red and orange leaves. In Otsego County, Cooperstown leaf peepers expect 65 percent transition by the weekend, with a nice variety of bright red, orange and yellow leaves and near peak conditions. Madison County will also be near peak with a lot of reds and oranges in the southern half of the county and a lot of yellow in the north between the hills and Oneida Lake. In the town of Mohawk, in southern Herkimer County, expect near peak foliage with 50 percent leaf transition and more reds and yellows emerging. In Schoharie County, the Schoharie Valley is enjoying the midpoint of leaf peeping season. Bright yellow, orange and red leaves can be seen throughout the area, with more changes to be seen in higher elevations. Foliage in midpoint of change will cover the Greater Niagara region this weekend. Orleans County spotters based in Albion expect 60 percent leaf change with bright shades of yellow, along with tinges of orange and burnt orange. Niagara County can expect between 40 and 45 percent color change according to spotters based in Lewiston. Fall colors, slightly more muted than average, include yellow, orange and red. Check out the viewing in the Niagara River gorge area from Niagara Falls downstream through Lewiston to Youngstown. Wyoming County expects 40 percent leaf change with an average to bright mix of red, orange and yellow leaves. In Erie County, look for 30 percent color change with quickly increasing fall colors of golden yellow and plum. Shades of red and orange are just starting to show. Leaves are mostly at midpoint of change in the Finger Lakes region. In Chemung County, Elmira-based spotters are calling for 50-60 percent color transition and a mix of peak and near-peak conditions. Fall colors are of average brilliance and include red and burnt orange, with shades of yellow coming on strong. Rochester and Monroe County-based spotters are projecting some near peak conditions for the coming weekend. Although leaf transition is still just 35-40 percent, many trees have dropped leaves due to the summer heat. Yellow leaves, of average brilliance, dominate on locust trees; red leaves on maple trees; orange leaves on silver maple and birch; and russet coloration is showing on white ash trees. Cortland County should see about 60 percent color change and midpoint conditions with mostly red leaves of average brilliance. Tioga County also expects 60 percent leaf change with brown, yellow and orange leaves of average brilliance. Fall colors are bursting in Ontario County, where the emerging dominant colors are orange, burgundy, rust, and gold with some hues of purple. Expect 55-65 percent color change by the weekend. In Tompkins County, Ithaca foliage spotters are calling for 55 percent color change with yellow leaves ranging from dull to brilliant, and conditions ranging from midpoint to near peak. Also look for some leaves of deep red and orange on top of the green backdrop. Wayne County should see about 35-40 percent leaf change with muted red, orange and yellow leaves emerging. Foliage in Onondaga County will be more than 30 percent changed with average to bright shades of yellow along with accenting reds. Livingston County will see 25 percent color change, as will Cayuga County. In Steuben County, look for 20-25 percent leaf change with fall colors of yellow and orange and still a lot of green. Yates County is still in the early stages of the foliage season. Look for just around 15 percent leaf change by the weekend with mostly muted fall colors and some patches of vibrant reds and oranges. The Hudson Valley will experience foliage in midpoint of change over the coming weekend. In Columbia County, spotters based in the City of Hudson expect 40-65 percent color change with the greatest changes coming in the county&apos;s northern portion and higher elevations. Look for bright yellows and oranges in the valley with reds in the higher elevations. In Ulster County, from Ellenville to New Paltz and into Rosendale, fiery red, bright orange and vibrant yellow have started to set the Shawangunk Ridge ablaze. In Marlboro, Milton, Modena and Highland, the heart of apple picking and wine tasting country, fall foliage enthusiasts will be greeted by leaves of fiery red and orange. Along the Hudson River, visitors to Kingston should expect to see plenty of red, orange and gold leaves mixed with green. In Dutchess County, foliage spotters expect 30-35 percent leaf change with bright orange and gold leaves. Westchester County spotters in White Plains predict 35 percent change with lots of bright golds and reds. In Orange County, conditions are nearing midpoint with 30 percent leaf change expected by the weekend. Look for brilliant flaming reds and shades of plum, lemon, gold, scarlet, chartreuse, mango, pumpkin and rhubarb. In Rockland County, foliage spotters at Bear Mountain State Park expect 25 percent leaf change with dull to moderate leaves of mostly green with touches of red, orange and yellow. Near peak foliage has arrived in the Thousand Islands-Seaway region. Jefferson County foliage spotters expect 60 percent leaf transition by the weekend with bright orange, yellow, red and burgundy leaves. In St. Lawrence County, the St. Lawrence Valley area should see about 40 percent leaf change with fall colors of orange, yellow and red of average brilliance. Foliage spotters in Oswego County reporting from along Lake Ontario and the Oswego River basin expect 20 to 30 percent color change by this weekend. Maples, oaks, hickories and sumacs are setting the stage and showing a bit more red, orange and yellow against a backdrop of russet, golden bronze and green pine. Fall color is just starting to arrive on Long Island. In the Hamptons this weekend expect around 20 percent change with touches of red, brown and orange. Foliage on western Long Island and in New York City has yet to significantly change. Get Up-to-Date Fall Foliage Color Reports Online The weekly foliage report, a detailed map charting fall color progress, vantage points for viewing spectacular foliage, suggested autumn getaways and weekly event listings are available by visiting the I LOVE NEW YORK web site at http://www.iloveny.com/. For additional New York fall foliage information including select sneak previews of the week&apos;s I LOVE NEW YORK Fall Foliage Report, follow the hash tag: #Fall4NY on Twitter. Simply type #Fall4NY into the search box on Twitter and you can access all of the tweets about New York State&apos;s fall colors, best places to see them, as well as fun fall events throughout the state. About New York State New York State features 11 beautiful vacation regions. New York&apos;s attractions span from landmarks such as Niagara Falls, to the wine trails of Hudson Valley and treasures like the Baseball Hall of Fame in Cooperstown. Whether it&apos;s wide-ranging outdoor activities for the whole family like fishing, hiking and boating, culinary wonders and farm-to-table fresh foods, or the rich history and culture of one of the 13 original colonies, New York State offers diverse activities for all travelers. For more information, visit http://www.iloveny.com. Media can find press releases and more at thebeat.iloveny.com.